PHILADELPHIA -- A judge has ordered the New Jersey couple who started a GoFundMe account, that raised $400,000 to help a homeless Philadelphia man, to appear in court. The Burlington County prosecutor said the search warrant was in connection with a criminal investigation. The attorney for the homeless man, John Bobbitt, said he learned from the couple's attorney that the money is all gone. Judge Paula Dow told the lawyer for Kate McClure and Mark D'Amico on Wednesday that she had a number of questions about the case and wanted to see the defendants herself. The couple also must give depositions about the money that was raised for Bobbitt. The judge also ordered the attorneys for both the couple and Bobbitt to get their paperwork in order, and figure out the money trail to see who spent what on both sides. Judge Paula Dow orders couple to appear in court over a GoFundMe account that raised $400,000 for a homeless man. Watch this video from September 5, 2018. Ernest Badway, the attorney for McClure and D'Amico, tried to assert his clients' fifth amendment right against self-incrimination. Badway also asked that two men, who appeared to be law enforcement, to identify themselves as they sat in the back row of the courtroom. Judge Dow then admonished Badway for his request. "To single out two individuals in particular is grandstanding, and you've done it for the press on both sides and I won't have any more of this," Dow said. Dow then told Badway why she needed to see his clients. "You should advise your clients that they are directed by the court to appear, and they can assert their privileges at that time. I am no longer comfortable with counsel representing what their clients purport to say, when I have no certifications from the clients, no appearances by the clients, and a record that before me lacks clarity at times as to what happened with the funds," Judge Dow said. Last week the court ordered the couple to turn over any remaining funds raised on GoFundMe to help Bobbitt. McClure and D'Amico started a GoFundMe account to help Bobbitt, who spent his last $20 to help McClure after she ran out of gas on I-95 last year. The total amount raised would have been $360,000 after GoFundMe's fees. The couple claimed through their attorney they gave Bobbitt $200,000. Bobbitt pinned the figure at $75,000 in cash, goods and services. He alleges the couple spent much of the donations on lavish trips, shopping sprees, gambling, and a used BMW. 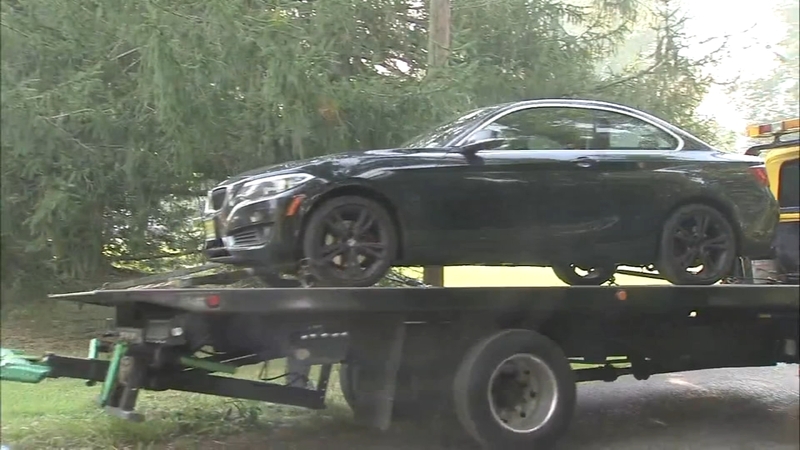 McClure had no comment as she drove off in that BMW from her Florence Township property on Tuesday. Defense attorneys want the couple's financial records to sort it out and conduct a forensic accounting. "The parties have to issue written discovery today, responses are due Friday, depositions are on Monday, next hearing is next Friday," said Bobbitt's attorney, Chris Fallon. "That's all I really can say." In court, Judge Dow referenced a text message while warning the attorneys that their clients need to communicate through them. Bobbitt's attorney said that text message was from last Monday. D'Amico allegedly texted Bobbitt after appearing on a nationally-televised show, that they could essentially get rid of the attorneys and they would turn over any remaining money.